We have seen some tremendous looking projects involving 3D printed cosplay, but I don’t think we have seen one quite as incredible as what one young woman named Chelsea has come up with. 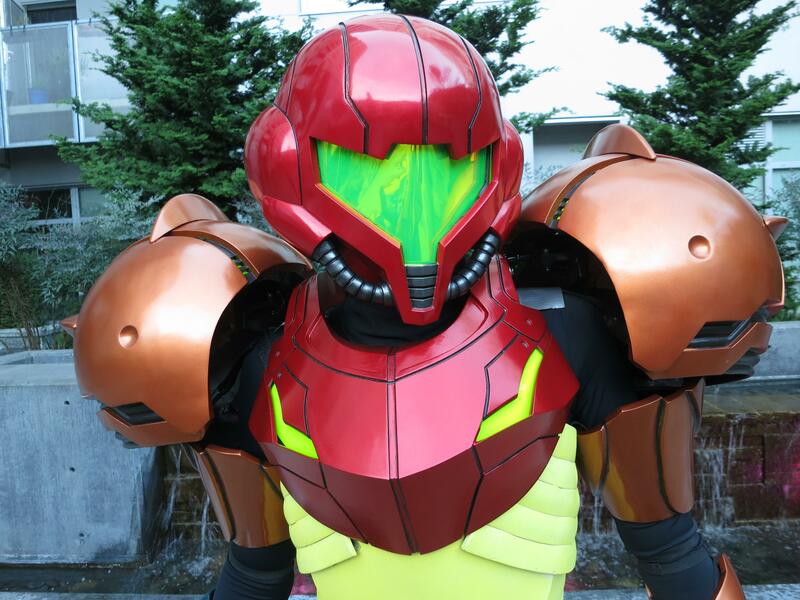 Avid fan of the science fiction action-adventure video game series, Metroid, Chelsea set out to create a 3D printed full-body “Varia Suit” worn by the game’s protagonist, Samus Aran. Starting in early 2013, Chelsea began working on her Varia Suit, and has finally completed the long process of designing and printing it. Thanks to her friend Matt Serle, who helped Chelsea handle over 100 hours of post processing and hundreds of hours of just printing the pieces to perfection, Chelsea was able realize her goal for only the cost of materials. Because the print bed on the Zcorp 450 is only 8″ x 10″ x 8″, Chelsea had to break the prints down into many small parts. For example, the helmet alone was printed in four separate pieces, and then glued together. Some of the design files that Chelsea used were obtained from other 3D modelers, while for the rest, she used Maya to model, and then Zbrush to smooth them out. This allowed her to get the perfect sized pieces, just how she wanted them. Once the pieces were printed out and glued together, Chelsea realized that something needed to be done to take the rough, layered look of the 3D printed objects and make them as smooth as possible. She sanded them down the best she could, but still found that the surfaces were not quite as smooth as she needed them to be. To fix this problem, she got the ingenious idea of applying a thin coat of Bondo to fill in the grooves, and then resand them. Once she had the pieces as smooth as she could get them, she applied a primer to each object. Just recently Chelsea finished the project which took her hundreds of hours of tedious, hard work to complete. The results were quite phenomenal, to say the least, as you can tell in the photographs provided. Be sure to check out Chelsea’s blog for more details on this project. What do you think? Would you spend the time it took to make your very own Metroid Varia Suit, if you knew it would turn out as cool as this? Discuss in the 3D Printed Metroid Varia Suit forum thread on 3DPB.com. Check out the videos below, showing this suit in more detail, as well as some additional photos.